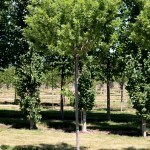 A genetic dwarf form of Green Ash that is grafted on a standard to make a small dense tree. Fall color is yellow. Usually grafted at 6', with the head growing to about 18' tall x 16' wide. It is a tough, adaptable tree for tight spaces.